First Apple had to deal with the anger of Bendgate, now Samsung's got its own "-gate" to worry about, following the launch of the Samsung Galaxy Note 4 phablet in its native Korea. According to reports in the South Korean press, some of the handsets have a small gap between the screen and the metal trim of the body. Worryingly, the gap appears large enough to slot a business card into. Samsung apparently addresses this issue in the handset's manual. Android Central picked up that, under the 'Troubleshooting' section, Samsung states: "This gap is a necessary manufacturing feature and some minor rocking or vibration of parts may occur." Futhermore: "Over time, friction between parts may cause this gap to expand slightly." Such an acknowledgement doesn't seem to have quelled the uproar over what is now being called Gapgate, and Samsung has also decided to issue a terse statement on the issue. "The reported issue does not impact the functionality or quality of the Galaxy Note 4," an official Samsung spokesperson told Trusted Reviews. "We assure our customers that all Galaxy Note 4 units meet our strict manufacturing and quality control standards." The issue doesn't appear to have affected South Korean demand for the phone. Samsung has sold out its entire 30,000 initial run. The phone isn't set to launch in the UK until October 10 and, build quality issues aside, is set to be a major draw for fans of plus-size phones. 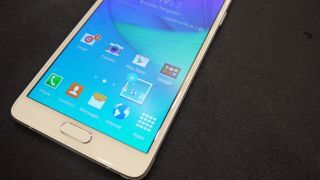 The 5.7-inch Super AMOLED QHD device uses a 2.7GHz Snapdragon 805 processor and 3GB of RAM. There's a 16MP rear-facing camera and 32GB of space upgradeable to 128GB with a microSD card.